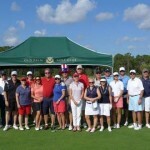 Memorial Day is always a big event at Old Palm Golf Club. Itâs a day for remembrance to honor the men and women who sacrificed their lives while serving in the U.S. military. Itâs also a day that traditionally kicks off the summer, and to celebrate Old Palm held a fun-filled golf tournament followed by a hearty BBQ lunch. The tournament began with the singing of the Star Spangled Banner by an aspiring young vocalist attending UCF a local performing arts college.Â Â The foursome of members and guests all had a great time as they competed in the shamble format held on Old Palmâs spectacular Raymond Floyd-designed golf course.Â The Shamble format allows each golfer to play their own ball after taking the best drive in the group contributing to the camaraderie. It was a clear day and not too hot when the players teed off at 9 a.m., so it couldnât have been more beautiful. Afterwards, the festivities continued for the golfers with an awards ceremony and a traditional BBQ lunch at the Club.